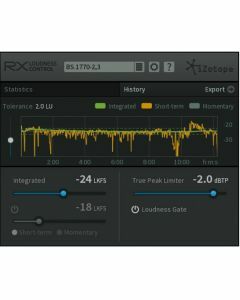 Designed specifically for audio/video post production and broadcast workflows, RX Loudness Control combines industry-leading, intelligent audio signal processing with an easy-to-use interface. Deliver transparent audio while meeting global broadcast specifications. RX Loudness Control works faster than real-time to ensure your audio mixes are delivered within the appropriate loudness standards. Designed specifically for audio/video post production and broadcast workflows, RX Loudness Control combines industry-leading, intelligent audio signal processing with an easy-to-use interface. Technical Specs:Latest version: RX Loudness Control 1.03 released August 9, 2016. Supported plug-in hosts: Media Composer 7.0.4 and 8.3.1, Premiere Pro CC*, Pro Tools 10-12. *Although iZotope support CC 2015, you will have to manually move the presets from the old location to the new location in order to load them. Additional host support is under development. Supported plug-in formats: Adobe Extension for Media Encoder CC, Adobe Extension for Premiere Pro CC, and AudioSuite DPM & AAX.